Hello again, Fabricistas!! 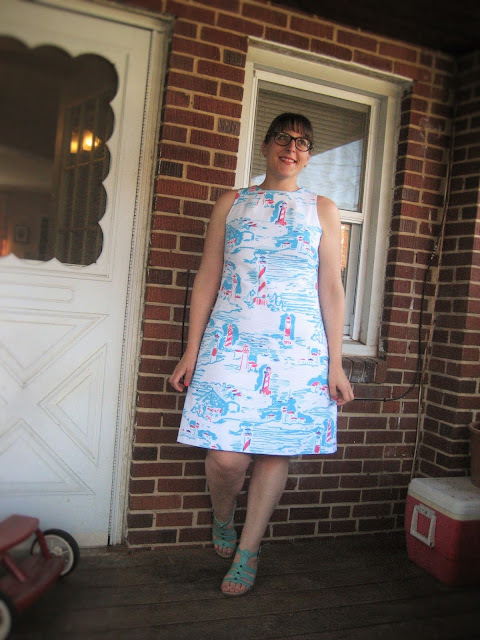 It's been a while since I blogged last, but I've been lurking about and occasionally sewing. While doing my daily (yes, daily, I am not shy to admit it!) rundown of Fabric Mart's new arrivals, I fell in love with this cotton pique lighthouse print fabric instantly. 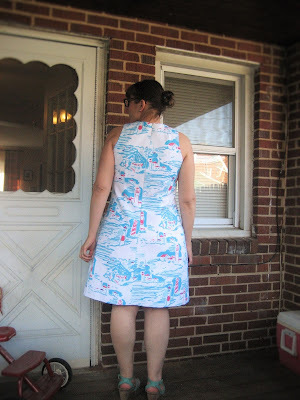 I did some research for inspiration and quickly figured out this material was for a Lilly Pulizter shift dress in 2014-- I love the Designer Fabric section... I've picked up some sweet designer surprises before in that category. It was not labeled with the designer's name, but I plugged into my search engine a few descriptive words about the print and up came a list of fashion bloggers wearing the original dress and then again on the designer's website. 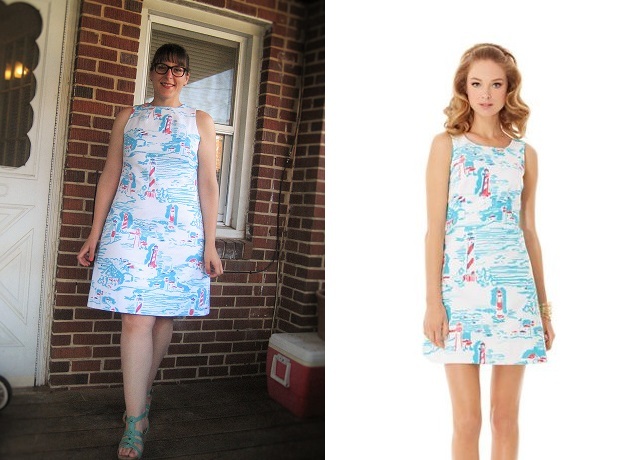 I made a version of the Lilly Pulitzer Delia Shift dress to fit my figure with a reprinted vintage 1960's pattern, Simplicity 1609. 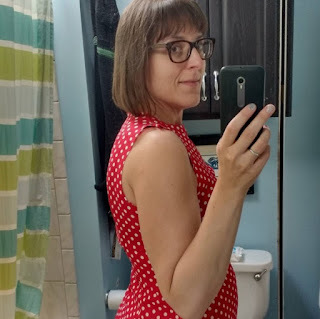 I used View C and cut a 16 bodice and made the skirt much more of an a-line, somewhere about a 20 or so. 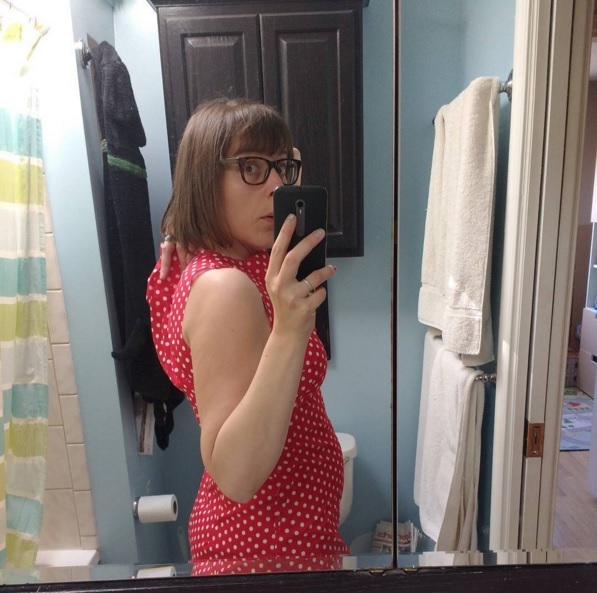 I also tweaked the overall fit on the side and back center seams, adding here and removing there slightly to fit my shape better. I originally added my usual 1" on to the length of the bodice, but had to remove it after making my muslin up. I did add an inch to the hemline afterwards. 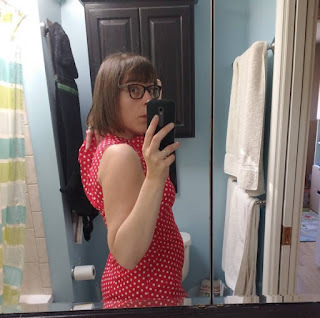 I have sewn up limited numbers of vintage patterns, and every time I've found that the upper back is monstrously humongous!! I had to remove about 3" total from the front and back upper bodice in total. 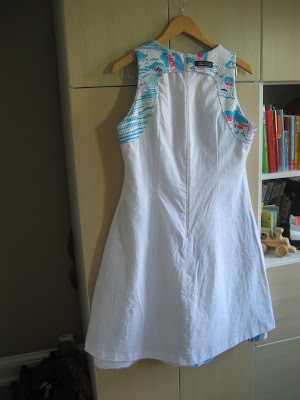 You can see the before and after on my red and white polka dot muslin below. I also removed the front center seam to keep the print one continuous piece. With that, I added a couple darts at the upper neckline. I extended the back sleeve opening by about 5/8" for my wider back shoulder. With such simple clean lines, I wanted to get the finishes super nice! I added a lining, it's a lightweight 100% cotton. I used an invisible zipper and of course hand sewed a blind hem. Overall I'm really pleased with this sweet little dress. 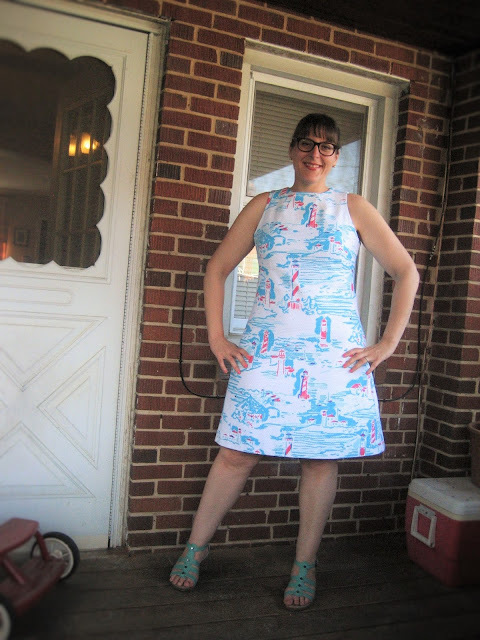 I know a die-hard Lilly Pulizter aficionado will be able quickly see it's not an original without the special imprinted hem tape that bares the designer's name... and the fact that my name is sewn in it! Now I'm totally ready for my weekend at the beach, which is exactly where I will be when this blog post goes live! It's beautiful! You did an amazing job! I love it! It looks great inside and out! Kathy, I love this, absolutely adorable! 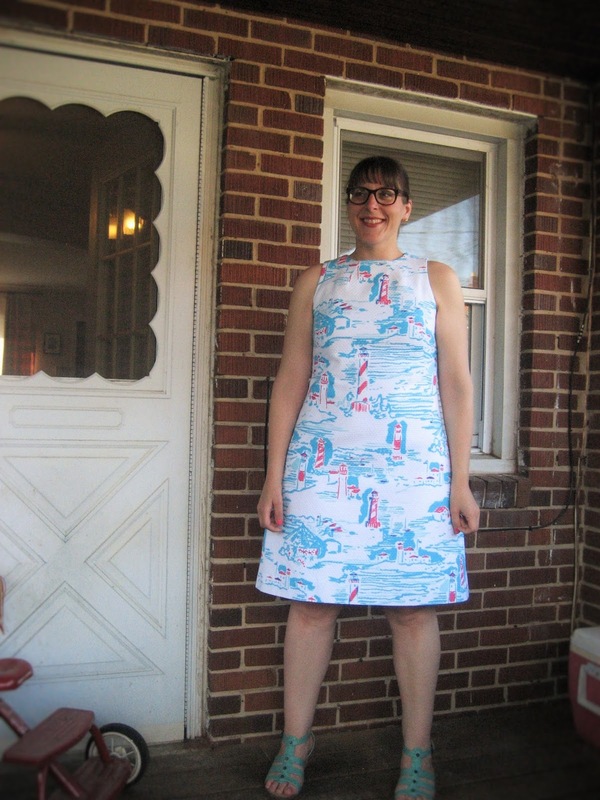 Thanks for the tip about vintage patterns, good to know! What a nice dress! I love the finished look on the inside with the cotton lining. Great for hot summer days ahead. You look very nice! Love the dress! It should be fun to wear! I LOVE THIS DRESS!!!! I would have never considered this fabric and I am a fabric freak so kudos to you and your inspiration dress that lead you to make this masterpiece. Oh my goodness!!! Thank you everyone!! !